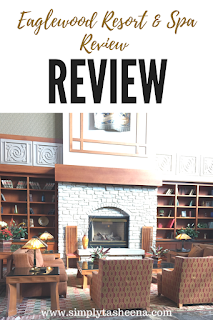 I recently stayed at the Eaglewood resort and as always like to share my experience. I'm always looking for new places to check out and I've learned that it's just a lot easier when you can get the perspective of real people. That's why I love sharing my review with my readers. The lobby of the hotel defiantly has that cabin feel which I truly loved. The ceilings are really high which really gives that luxurious feeling. I love that the lobby of the hotel is really large and his beautiful scenery. This hotel is about 20 miles from the O'Hare airport. This hotel is not located on the main road or when waking distance to shops. It defiantly has the Resort/Spa feel to it. I love that this hotel sits on a golf course. This hotel also has an onsite gym, outside swimming pool and hot tub. I also love that this resort has an onsite spa. This hotel has several restaurants, stores and bars onsite as well. The staff was really nice. Everyone went out of there way to make sure I had everything that I needed. The staff was also really friendly everyone would say hello which was super sweet. I must say this-this hotels room was a really great size. I was really pleased that my room also included a balcony that was the length of my window, how cool is that? The room was updated and was a great size. The decor was modern with a touch a country. The beds were also really comfortable as well.I also love that I didn't hear anyone in the rooms next to me which really made my stay relaxing. This resort had the most amazing views. Picture perfect for a wedding. From decks overlooking the amazing golf course to the beautiful fire pit that's perfect to enjoy any time of the day. Especially at night. I would stay at this resort again. The grounds are well kept. The staff was really nice and the rooms are clean. This hotel is perfect for a family vacation or even if you need some "me time". The room looks lovely! And with a hotel this close to the airport travel seems stress free doesn't it? This looks like a lovely place to stay! Everything looks so clean. I would probably relax by the hot tub. Girl, that room though! Wow. Clean, professional, stress free, comfortable. Seems like the perfect place to go. What a lovely looking resort! It all looks immaculate. Great views, too! The Eaglewood resort sound like heaven for a relax for a couple of nights! And I love the idea that the resort is faraway from everything so I could just concentrate to just relax without any distraction! Whoa, what a luxurious property it looks to be, completely fascinated by the beautiful location and the comfy space it has. The property is gorgeous. What a retreat. What a lovely looking resort! It all looks amazing...Lovely views too! Looks like a really well kept and clean resort. Love that golf course area? Adds so much to the beauty of the resort. Your room and views outside looks good. Glad you enjoyed your "me-time". You deserve every pampering! I love these types of resorts which are more low key so relaxation time can truly be done. Too many resorts round theme parks are just too busy. The Eaglewood Resort and Spa looks like a wonderful place to recharge and relax. I love when I stay somewhere and it is quiet and I can really unwind. I like that your room had a balcony too.